Be the first to share your favorite memory, photo or story of Pamela . This memorial page is dedicated for family, friends and future generations to celebrate the life of their loved one. 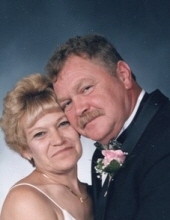 Pamela Jean Buhl Mims, age 66 , of Hurricane Creek, Kentucky, passed away Sunday September 2, 2018 at the Pikeville Medical Center. Pam was born August 20, 1952 in Wyandotte, Michigan the daughter of Delores Scholff Buhl Modic, of Trenton Michigan, and the late Dale James Buhl. She was also preceded in death by her husband, Willie Albert Mims, March 4, 2016 and her sister, Cindy Snyder. Pam was a treasurer for the Hurricane Volunteer Fire Department, was of the Catholic Faith, and a loving home maker. Her survivors include: one son, Robert James (Yvonne) Mims of Honor, Michigan, two daughters, Tammy Jean (Ron) Murt of Lawton, Oklahoma, and Christie (Mike) Neal of Wyandotte, Michigan, six grandchildren, Clinton (Jamie) Murt, Travis (Carley) Murt, Dalton Mims, Dylan Neal, Logan Neal, And Dustin Mims, one brother, Ron Buhl of Wayne, Michigan, one sister, Gail Miller of Boone, Michigan, two sisters in heart, Mary (Tommy) Bush and Bernadine Mims both of Hurricane Creek, Pikeville, Kentucky, and her Fur Babies, Rags, and Minnie. Burial will follow at the Mims Family Cemetery at a later date. To send flowers or a remembrance gift to the family of Pamela Jean Mims, please visit our Tribute Store. "Email Address" would like to share the life celebration of Pamela Jean Mims. Click on the "link" to go to share a favorite memory or leave a condolence message for the family.